Commandos do not come cheap. 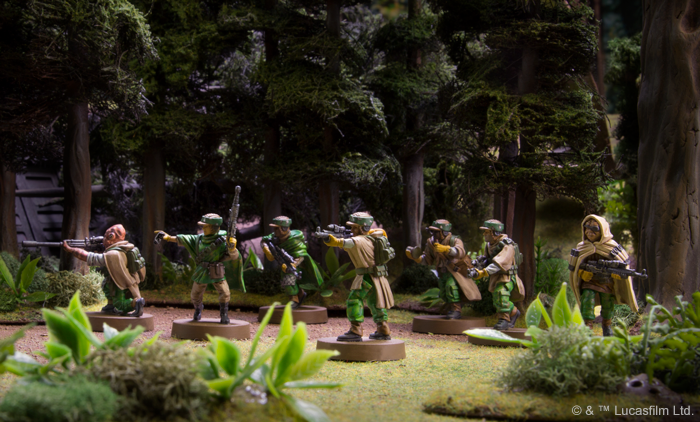 While the generic Corps troopers clock in at 48 for the most expensive (Snowtroopers - 12 / mini) the Commandos cost 60 for a 4 mini squad (15 / mini). So, you'd hope they'd at least be good to make up for their cost. And first glance, they look an awful lot like the Corps Rebel Troopers, but the differences pop out quickly. 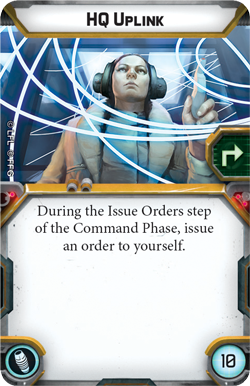 First, they aren't a Corps unit, so taking them will diversify your command pool. They are still a Trooper unit though, so they'll be able to claim objectives much like the Corps Troopers do - good if you want more units capable of scoring objectives. Offensively, they have the same weapons as the generic Rebel Trooper - the A-200 Blaster Rifle - rolling 1 Black for ranged attacks at distance 1-3, and rolling "Unarmed" for melee at 1 Black as well. Fortunately for the Rebel Commandos though, they gain a Surge -> Hit, giving them improved offensive capabilities. They also have the Sharpshooter 1 keyword, giving them the ability to hit through partial cover. Defensively, they are only 1 health per mini, with a white defense die. Much like other generic Rebel troopers, they have Surge -> Block. However, they also have Low Profile, which gives them heavy cover any time they are in light cover (including if they have a suppression token). So, they can pretty much ignore following cover as you advance them up the battlefield, while still retaining the defensive bonus. They also have a courage value of 2, meaning they can not only take a suppression token and not lose an action, but they also don't panic until 4 without a commander nearby. Movement is interesting - while they start with only the standard Speed 2 for a Trooper, they also get Scout 2 letting them jump forward on deployment. 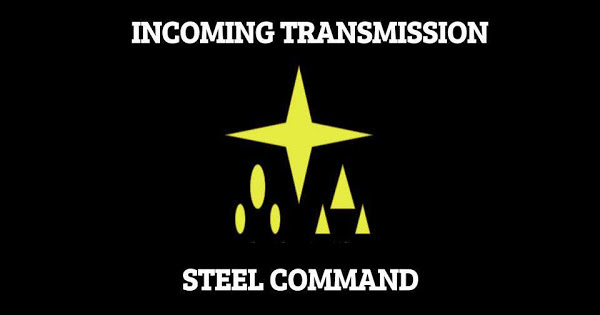 This means you can contest objectives faster, or get into position for their heavy weapons teams more effectively. But wait, there's more! Instead of buying the full team of Rebel Commandos at 15 points per mini, you can buy just one mini at 16 points! Except you HAVE to take a Heavy Weapon upgrade with it, and use that mini as your unit leader. Other than only having 1 mini (+1 the mandatory Heavy Weapon mini), the reduced cost, and the Heavy Weapon Team keyword, there is no difference between this unit and the full team of Commandos. Effective cost for this team is 42 or 44 depending on which upgrade you select. * = comes with this expansion. I think a lot of people have been looking forward to this card being revealed. What will Snipers do? The answer is to shoot across the map - Range 1-Infinite - with a Black and a White die. Not terribly impressive aside from the range. However, the DH-447 Sniper does have High Velocity and Pierce 1 keywords, giving you the benefit of hitting opponents with Dodge tokens, and keeping them from using them. This does include Jedi, though they will be immune to the Pierce. Between High Velocity, Pierce 1, and the natural Sharpshooter 1, this can do small but significant damage. You average 1.00 hits with this weapon, and an aim shot gives you an average of about 1.47. So, good for softening up targets and good for suppression from across the map, all for 44 points on a Strike Team. Each "Charge Token" thus armed can be detonated by any Saboteur on your team, at any time an action is taken. This is not an action, or a free action. This does not interrupt the action, but takes place after the action finishes. This causes the token (not the Commandos) to make an attack against everything at Range 1 of the charge, and the attack is 1 Red / 2 White with Surge -> Crit and Blast / Impact 1. So you're averaging 1.625 damage on everything in the blast zone, with no cover and .75 natural critical rolls in addition to the Impact 1. So this can at least be threatening to Armor units and Cover 1 units. 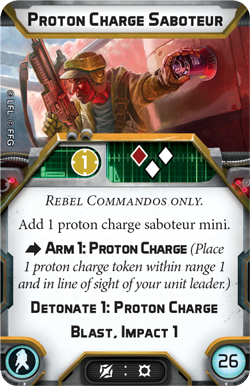 Again, any unit with Detonate 1: Proton Charge can detonate the tokens, so a unit with a Proton Charge Saboteur across the map can detonate even if the unit that placed the token in the first place is wiped out. Get that suppression token early so that you can have immediate Heavy cover. With this upgrade you can walk your Saboteurs across the map without giving a single care about enemy fire, or put this on a Sniper Strike Team and not worry about AT-ST Mortar Fire accidentally hitting you while it pins you down. 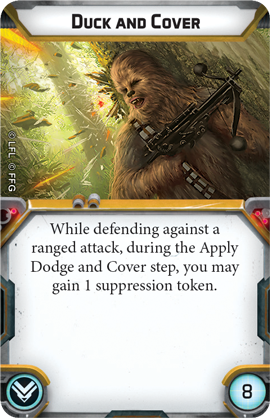 The best part of this card is that if you only get attacked once, you will be right back at the 1 suppression sweet spot next turn. No lost action, but Heavy Cover while standing in the open. 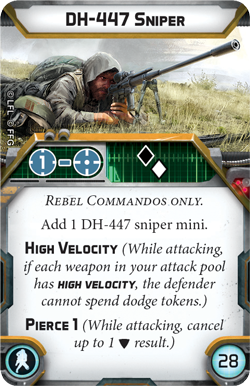 Okay, I think I'm more excited about this card outside of Commandos than I am with them. There are SO MANY things this card links with that it's not even funny. 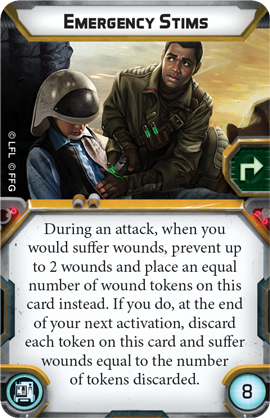 So far the units that can take this card are: AT-RT, Airspeeder, Commandos, Speeder Bikes, AT-STs, (and presumably Scout Troopers). Luke - If you have this equipped to Commandos, you can give them a dodge token with My Ally Is The Force. Leia - If equipped to a Commando, you can let them move with No Time For Sorrows. You can also use this with Somebody Has To Save Our Skins - though chances are you're already close enough to issue the order to begin with. Han - Did someone call for a Reckless Diversion? Still limited to Troopers, so Commandos only for this one. Vader - Use this with Scout Troopers to get that free action with New Ways to Motivate Them. Veers - Here's where it gets fun. Evasive Maneuvers with your vehicles, or just get a recover action (which refreshes HQ Uplink!) with Imperial Discipline! The sky is the limit! HQ Uplink is like... right there. It comes with the unit. This one is an interesting one to think about. A small Strike Force with Comms Jammer running around tossing mines and making enemies commands more difficult is amusing to think about. Or a full team of Saboteurs for that matter. Not the most useful upgrade. Snipers don't need it. Saboteurs can't use it. You're looking at taking it just for the guys with blasters. I almost consider this worthy of stapling to the Sniper upgrade card. Get high, see more things, shoot more things. Unhindered might be a big help, especially if you're planning on hiding in Light Cover / Difficult Terrain. Even more so if you're running around laying down a mine cover. Not quite an auto-include though. A pretty good idea to include on your Strike Force to double your effective health for one good zombie push. Also lets you suicide yourself into an enemy if you've got a Saboteur - Arm and immediately Detonate (Arm was an action after all!) You're already dead, might as well take some of those Stormtroopers down with you. Stims just get better the more health and potential damage / points you have available to yourself. With Sharpshooter 1, Concussion Grenades aren't really all that useful. Impact Grenades could be helpful, but really you're not boosting the combat power of the Commandos by taking grenades. So unless you want to specialize in anti-Armor, leave them at home. Kaboom! Even if your main Commando team dies, you can still set off their mines as the Strike Team hides in the rear of your lines with a detonator in hand. That's pretty cheap for a good support unit. Cheaper than a naked AT-RT to make your opponent worry about a lane. Get to the top of something big with good sight lines and lay down covering fire from across the map. That's it for the Commandos. Hopefully we see some good announcements at GenCon!